Set in the countryside, this hotel is located 10 km from Kiev and offers a private beach on the lake. A sauna, billiards and free Wi-Fi are featured at Hotel Complex Petrovsky Brovar. The bright, air-conditioned rooms offer warm-coloured interiors and classic-style décor. Each modern room includes a TV, a minibar, a balcony and a private bathroom with bathrobes and a hairdryer. The on-site restaurant serves Ukrainian and European cuisine, which guests can enjoy together with live music. Barbecue facilities are also available. Guests can fish in the lake, play billiards or sing karaoke, and children can entertain themselves in the playground. Petrovsky Brovar bus stop is 20 metres from the hotel. Kiev Central Train Station is 28 km from Hotel Complex Petrovsky Brovar, and Boryspil International Airport 25 km away. Situated in the Terminal Entertainment Center in Brovary, this Bavarian style hotel offers a gym, an indoor swimming pool, a sauna and massage services. Free private parking and free Wi-Fi are available. Rooms at the Landhaus Hotel are simply furnished with German-made furniture. Each is equipped with air conditioning, satellite TV, and a minibar. Some rooms have a spa bath. The Landhaus offers numerous activities for recreation and fun. There is a cinema, a go-cart track, an ice-rink. Guests of Landhaus Hotel can use spend 2 hours in the Aquapark for free. Hotel Landhaus is located 30 km from the Boryspil Airport and an airport shuttle can be arranged upon request. Offering free Wi-Fi and parking, Hotel Kruiz is located in a quiet area of Brovary, just a 10-minute walk to Peremohy Park. The Terminal Aqua Park and Shopping Centre are 500 metres away. The colourful rooms feature air conditioning and satellite TV. The private bathrooms come with a shower and free toiletries. Guests of Kruiz Hotel can get a discount at the Orekh restaurant. Other cafes are 500 metres away. Poroshynka Bus Stop is a 5-minute walk from the hotel. Brovary Train Station is 2.5 km away. Boryspol Airport is 21 km away. The elegant Grand Sport Hotel is located in the centre of Brovary, just a 5-minute walk from the Peremohy Park. The hotel offers rooms with free Wi-Fi and a TV. Rooms at Grand Sport Hotel are air-conditioned and offer wooden furniture. Some rooms come with private bathroom, and shared bathrooms are in the hallway. Guests are welcome to relax in the lobby bar and taste Italian cuisine in the restaurant. Grand Sport Hotel features large territory with a garden and free parking. Gagarina Street bus stop is just outside the hotel. Kiev Central Train Station is 29 km away, and Boryspil International Airport is 28 km from the hotel. S legkim parom is located in Brovary and offers rooms with free Wi-Fi. Guests can try the sauna and enjoy the restaurant serving typical Ukrainian cuisine. The air-conditioned rooms feature a TV and wardrobe. The private bathroom is complete with a shower. Breakfast is served every morning in the dining room. S legkim parom is 20 km from Kiev. Boryspil' Airport is a 30-minute drive away. 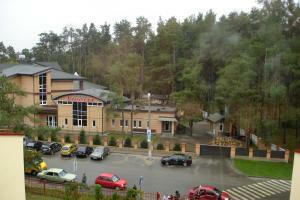 Hotel-Restaurant Complex Vensky is located in the woods in Brovary. Free WiFi access is available in all areas. The bright classic-style rooms feature a TV. The bathroom comes with a hairdryer and free toiletries. At Hotel-Restaurant Complex Vensky you will find a 24-hour front desk and a restaurant serving dishes of Ukrainian, European and Austrian cuisine. Brovary Train Station is within a 7-minute drive. A shuttle to Boryspil International Airport (40 km) is available at surcharge upon request.